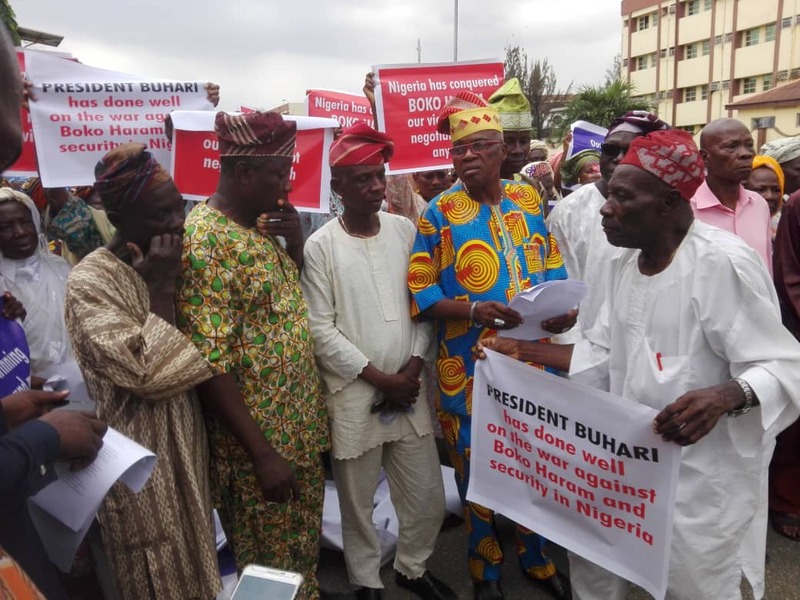 The ongoing war against insurgency took an emotional twist on Friday after a group of octogenarians took to the streets of Lagos to commend President Muhammadu Buhari for decimating the Boko Haram insurgency. 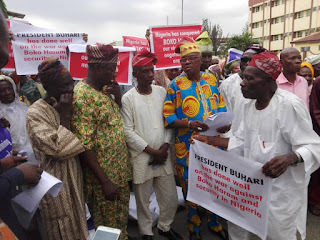 The groups during a rally which kick-started from freedom park in Lagos and ended at Alausa Govt House witnessed thousands of the elderly Nigerians paying glowing tributes to the Nigerian Army and it's leadership. Southwest Veterans And Concerned Patriotic Elders’s (SouthWest-V &PE), Elder Johnson Adebayo said President Buhari has liberated several communities held by the insurgency in same manner of the Biblical Moses liberated the Israelites from their Egyptian captors. He said, "We have seen a repeat of Moses’s leadership of the Israelites in their most difficult times, reflected in the present leadership of our cherished country Nigeria, by President Muhammadu Buhari. He has played the role of the Chief armour bearer of the defeat of the enemies of Nigeria, as directed by God. "The idea of this elaborate, a thousand-man rally march from us, Nigerians of septuagenarian and octogenarian ages is to drum support for President Buhari’s rewarding leadership. It is also our token of open appreciation of the Nigerian Military for their courageous demystification of the formerly deified Boko Haram insurgents." Elder Adebayo also expressed joy in the various reforms introduced by the President, stressing that the sanitizing reforms launched by President Buhari have reduced corruption in the public service to its barest minimum. He said, "it has erased the bottlenecks strewn on the path of elderly citizens of this great nation in accessing their retirement entitlements. "Our President is leading Nigeria on a progressive path in many ways. Some of us are proud beneficiaries of his welfare schemes like the Conditional Cash Transfers to the elderly and less privileged Nigerians under his Social Investment Programme. "The school feeding programme for our children in primary schools across the federation is another unquantifiable assistance to the elderly, which has lifted the burden of searching our pockets and bags every morning to find feeding money for our school children." According to him, "we cannot overlook President Buhari’s resuscitation of collapsed infrastructure in the country. The railway is back; our refineries are back; textile and automobile industries are brimming with life now. Youths are being empowered through N-Power jobs and dilapidated roads, we never dreamt of seeing their rehabilitation in our lifetime have come to reality. We travel on it, but our old and tired bones do not get cracking with ache." He also commended the Service Chiefs for their splendid day to day leadership of the military, resulting in the spectacular job of defeating Boko Haram terrorists in Nigeria.